Cobbett's Pond, in Windham New Hampshire, has experienced a dramatic transformation over the past twenty years. The summer cottages and seasonal lifestyle have been totally replaced by upscale homes with year round residents. My great-grandfather's farm ran to the shore of Cobbetts Pond in Windham and my grandfather rented summer cottages along the shore. I grew up on Cobbetts and still live there today. The changes that are taking place along the shoreline are simply amazing to me. The old summer cottages are being replaced by luxurious waterfront homes and the recession has had little impact on the pace of change. A little history first: Cobbett's Pond was named for the Reverend Thomas Cobbet, a minister from Lynn and Ipswich, Massachusetts who received a grant of 500 acres on its northern shore in 1662. The first summer cottage was built in 1886. From then until the 1970's the pond remained largely a summer community with public beaches, a dance hall over the water and a thriving summer theater nearby. When I grew up on Cobbetts most of the residents disappeared after Labor Day. There were a smattering of year round residents but all my lake buddies were gone in the fall. All that began to change in the eighties when a few cottages were demolished to make way for modest year round homes. The real change occurred in the early 1990's. Prudential Dinsmore Associates sold 3 waterfront lots on the "big pond" that had remained vacant for years. The prices in the $225,000 to $250,000 range raised the bar at that time. At that same time, we also sold quite a few summer cottages in the $300,000-$350,000 range which were torn down for new upscale homes. This was the beginning of the changes on the lake. Today, it seems that a cottage is being torn down every time you go out in your boat being replaced by a lavish new home. The increased desirabilty of the town of Windham has raised the cache of Cobbetts. The main appeal is that you can enjoy waterfront living close to work. If you are going to make a large investment it is nice to know you can enjoy your lake house each and every day without having to travel two hours to the north. Many business owners and professionals from southern New Hampshire and northern Massachusetts call the lake home. A good many of the new homes are being built by Windham residents who want to stay in town but want to live on the water. Of course Boston is a straight shot down Interstate 93, less than 35 miles to the south. The market for waterfront property on Cobbetts remains strong in spite of the current downturn. Waterfront properties that are priced correctly are selling to the pool of buyers who want to be on the lake. Imagine enjoying your "front" yard by the water as the warm sun rises over the lake while a Great Blue Heron flys by, low over the water. Savour the drive home from work, turn onto your narrow road, knowing the day is done, and walk barefoot to a lakeside patio to enjoy the an evening cocktail. That is until the kids start begging to go tubing or water skiing. There is a firework display over the water on the fourth of July. Even the winter is enjoyable watching the carnival of ice fishermen, skaters and snowmobilers. This is lakeside living at its best and it all can be yours. Cobbetts Pond is a 302 acre spring fed lake with an average depth of about 30 feet and with 50 feet being it's deepest. The "Big Pond" and the "Little Pond" are divided in the middle by the "Narrows" giving the outline the lake an hour glass shape. There is a seperate village district that taxes for lake improvements and water quality initiatives. 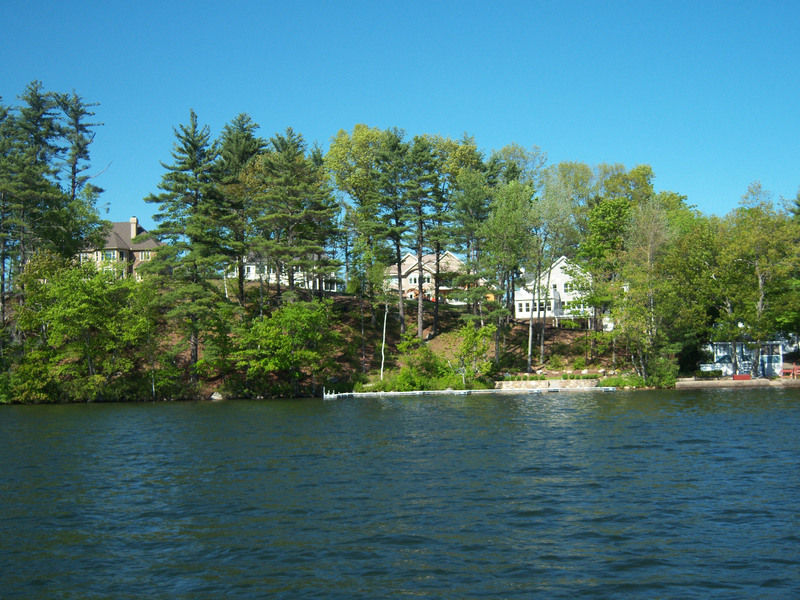 All waterfront construction is governed by local Windham zoning laws and the state of New Hampshire Shoreline Protection Act. 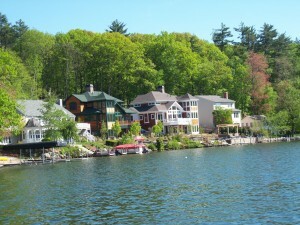 More information about waterfront living in southern New Hampshire here. Overlooking the "Narrows" this exquisitely appointed residence offers crown moldings, hand-crafted cabinetry and designer fixtures. Incredible custom kitchen features granite and opens to the great-room which offers panoramic lake views. Luxurious master bedroom suite with fireplace an spa bath overlooking the water. Over 6,000 Sq.ft with ten rooms. 3 car attached garage plus a 3 car carriage house with an unfinished bonus room above. A unique lot with over 100 feet of frontage and offering beautiful views and sunsets. Offered at $1,395,000. Click here for full details and more pictures. Waterfront elegance can be enjoyed in this beautiful custom home. 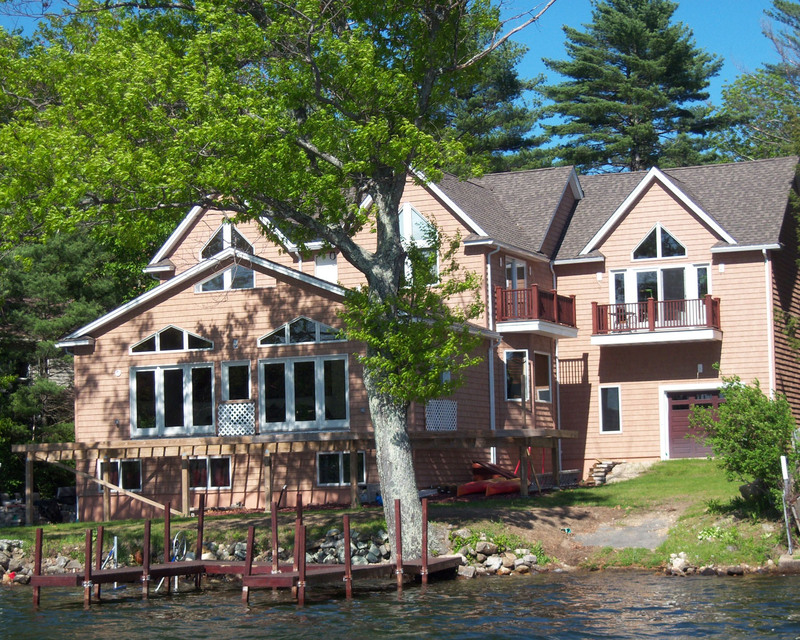 114 feet of lake frontage allows you to enjoy sweeping lake views. Impressive entry with leaded glass doors and handsome wood and cast iron staircase design. Designer kitchen with granite counters. Beautiful master suite and attached two car garage. Offered at $1,150,000. Click here for full details and more pictures. 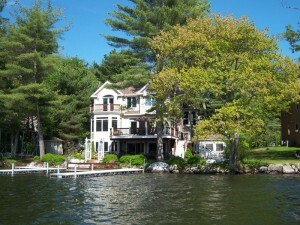 See all of the current homes for sale on Cobbetts Pond in Windham NH.